Jack looked through the bottom of his mug as he up-ended the dark brew. There he was... the bounty hunter. Seventeen months of running was going to end today. He set his mug down, shoved back his chair as he stood up, and poised his hand over his pearl-handled Colt. "Mister, I think you're lookin' for me..."
Now you can run combat for the Rolemaster Standard System in post-medieval settings! 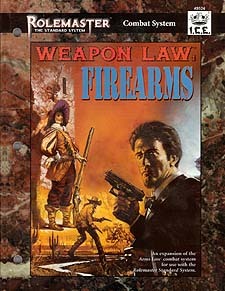 Weapon Law: Firearms provides all of the tables and information you need to resolve combat involving firearms in any era from the Renaissance to the modern day. * More than 40 attack tables covering all firearms through the modern day. * A master listing with complete statistics for over 500 specific weapons covering all major areas and times from medieval to modern. * Seven new critical strike tables and a new weapon failure table for use in resolving firearm combat. * Rules for how to incorporate firearm combat into your role playing game. * Guidelines on how to "extrapolate" firearm information so that you can add weapons to the master weapons listing and use these new weapons with Weapon Law: Firearms. * All material presented in a convenient 3-hole drilled, perforated format.